To help our Folio users easily record, review, and update information about their projects, we’re always looking for ways to make the system easier to use. For example, we needed a simple user interface that would make it easy to find and update single records, while at the same time provide the capability to review progress and monitor underperforming activities at a high level, over time. This is actually easier said than done. Activities have many associated data points, and each component may also have many activity records. How do we approach this challenge in a way that maximizes our users’ efficiency in editing and reviewing data? 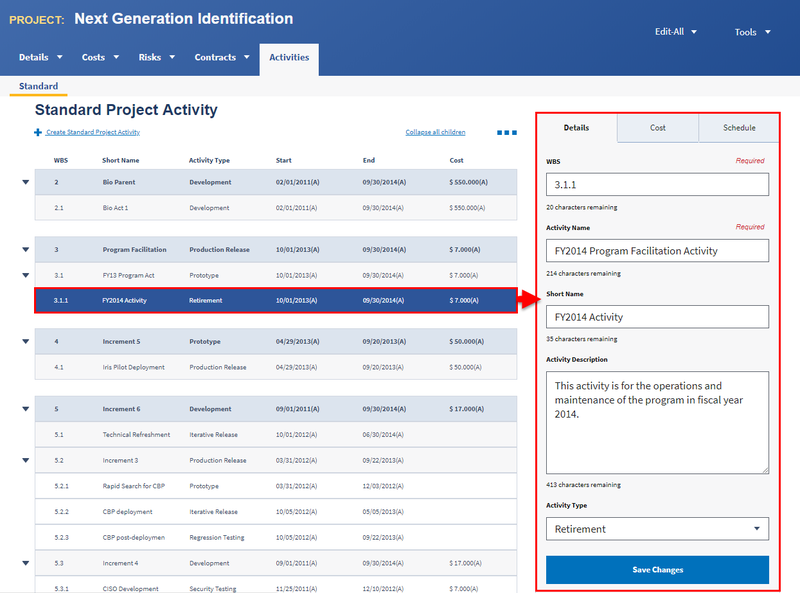 The solution involves a combination of two features already implemented in other areas of Folio – the activities grid, and the activity inspector. The concept of tracking a set of hierarchical activities for a project or asset naturally lends itself to a tabular or grid display. This allows a clear presentation of the hierarchical structure of activities, and provides insight into how costs and schedule dates are rolled up from child to parent records. This is a screenshot of the Activities Grid showing multiple levels of hierarchy within. The grid, however, is not sufficient on its own to show the full scope of data within each activity. Rather than overwhelm users with 15 data points in the grid, we opted to present only the most pertinent data points. However, we also needed a way to give users access to the rest of their data. This is where the activity inspector comes into play. To display the rest of the data, we implemented a special form component called the “inspector,” which is an editing panel that allows a user to select an activity from the grid. Once the activity is selected, the inspector appears, populated with the full set of data points for that activity. Much like the Project and Investment templates in Folio, the inspector contains its own sections of data to improve usability and enhance users’ ability to find and edit data. This is a screenshot of the inspector showing the data fields from the Details tab. When viewed together, the grid and inspector offer users a flexible and efficient way to navigate through, and edit, their data. 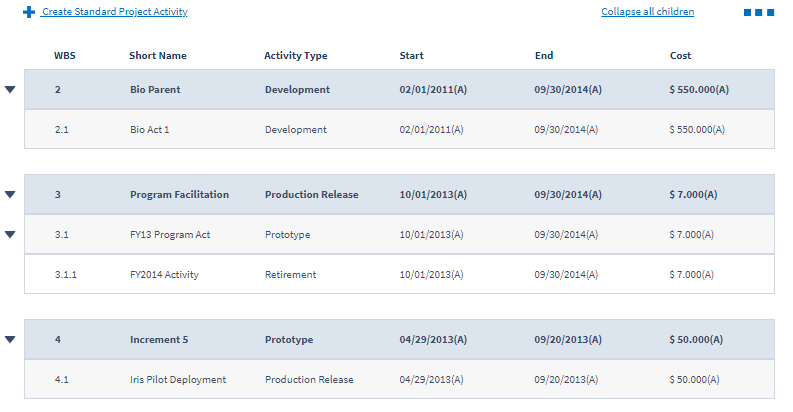 This is a full screen view of the Activities Grid and Inspector together. Activity 3.1.1 is selected, and its data is displaying in the inspector. In the above example, activity 3.1.1 is selected. As you can see, the data for that activity is now displayed within the inspector, on the right side of the screen, where it can easily be edited or reviewed. In addition to improving the overall presentation of activities, we sought a way for users to intuitively manipulate their activity structures in Folio. Our solution was to allow users to manipulate the activity hierarchy using the WBS value for each activity. With this approach, users can quickly restructure their activities to meet changing needs and requirements. We continue to explore the use of different user interface (UI) components to display data templates to users, such as our implementation of the Life Cycle Costs Ledger. This allows Folio to remain flexible and adaptable to changing user requirements across our many customer agencies. We are excited to share these new implementations with you. Be on the lookout for opportunities to participate in Folio demos, and please reach out to us at folio.pmo@gsa.gov with questions or comments!